LotFP: RPG: Cleric Art - Back to the Roots! Nice! "Solomon Kane, Vampire Hunter" has a nice ring to it. A new class, The Puritan Assassin. Picture is great. Love the perspective. Looks more like a WFRP 2nd ed Witch Hunter. Do it! Tinker with their spell list (remove most of them). Just give them subtle dispelling type stuff - did they do something awesome? Who knows. You're a rouge game developer! Oh, very nice. Looks very much like what I would have expected to find the Moldvay/Cook books if the game had gone for a more 17th century feel. Much more interesting than the Friar Tuck variety. 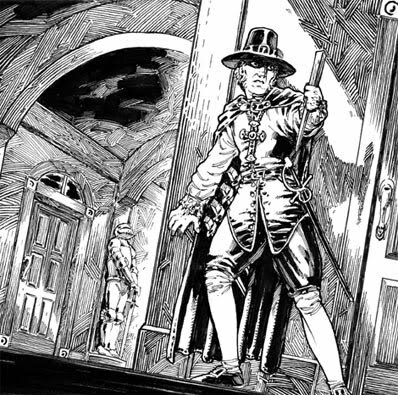 I especially like that because original cleric class has been said to been inspired by Peter Cushings vampirehunter role in several Hammer-films. Very nice. This picture actually makes me want to play a cleric, which has always been one of my least favourite classes. I can't stand the usual posturing and holier than thou attitude most players fall back on when playing clerics. Now this one, I like! I believe you mean "rogue game developer". Its good in its own right but not *consistent* with the previous cover. Since the game doesn't present a setting as such, a certain amount of inconsistency is both desired and intentional in order to encourage customization and relay the fact that there are unlimited possibilities. The three covers for the books are by different artists with *wildly* different styles and feeling to the pieces. Actually in the case of both this pic and the Mullen cover they're a bit futuristic compared to the rest of the game. This pic is clearly 1700s-inspired and when I look at Mullen's I think 1900s since the robe design is very much Devil Rides Out-inspired.